This Cattle Brand Bar S Reverse G now hangs proudly in a home in West Central Alberta. Along with this picture there are 6 others detailing this panels construction. After polishing and cleaning we then carefully drill 2 properly measured holes in the zinc came, attach rings and chain. The completed panel measured 20 x 20 inches. Once the black patina has been applied we then clean the panel with Kwik Clean, this photo shows the panel upside down. We then attached a 1/2 Zinc Came U Channel frame ensuring that all joints that meet the frame a securely soldered on both sides. We then clean those joints with steel wool, apply black patina then clean again with Kwik Clean. Then we apply Kemo Pro Polish to both sides and once dry spend a fair amount of time polishing and cleaning the panel using a soft cloth and tooth brushes. We also go around each seam with folded paper towel, along with spending time examining the panel in sunlight to ensure that each piece of glass and it’s seams have been completely cleaned and polished. Once both sides of the panel are soldered we use #0000 steel wool to clean all of the solder seams. Never use any other grade of steel wool than # 0000 as anything else will scratch the glass. The panel is now ready for soldering. 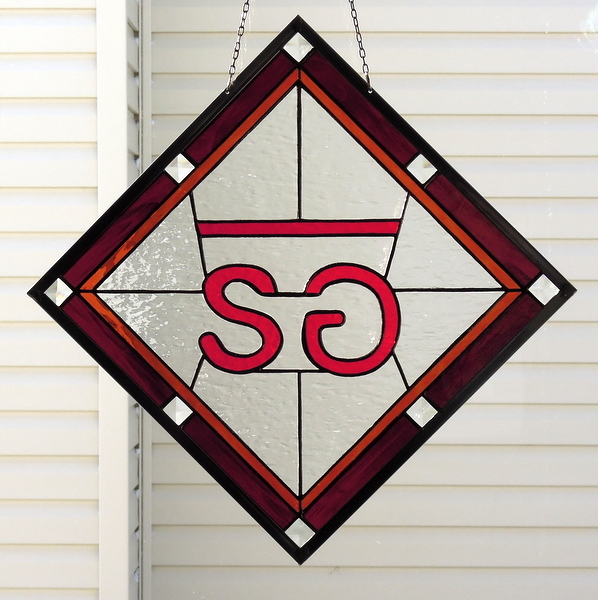 Once we were satisfied with the letters and after adding a small lighter amber colored Spectrum Waterglass frame edge, we then used Spectrum’s Clear Vecchio glass to fill in the centre of the panel. Here again our saw and small grinder heads were used to get these pieces to fit around the letters. The next photo shows the completion of the surrounding edging where we used a Spectrum dark amber glass. The brand was made from Spectrum’s Cherry Red Rough Rolled. 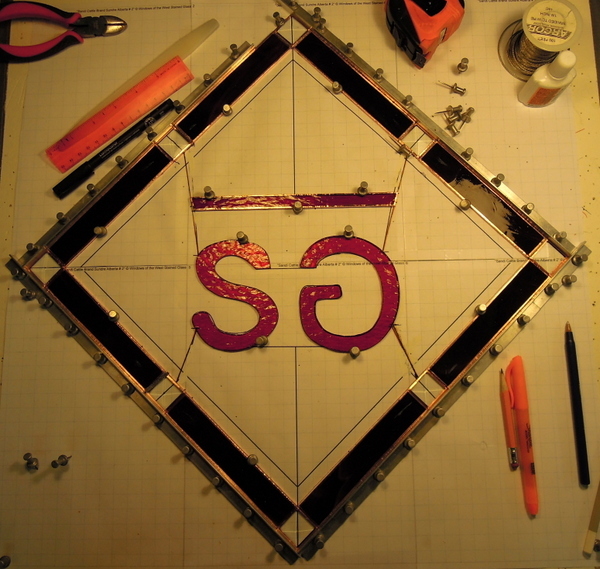 The S and reverse G are each 1 piece of glass cut on our Taurus 3 Ring Saw. It was some what tricky to get all of the edges ground correctly but patience along with our Glastar Allstar grinder using 2 small grinding bits made the work relatively easy. 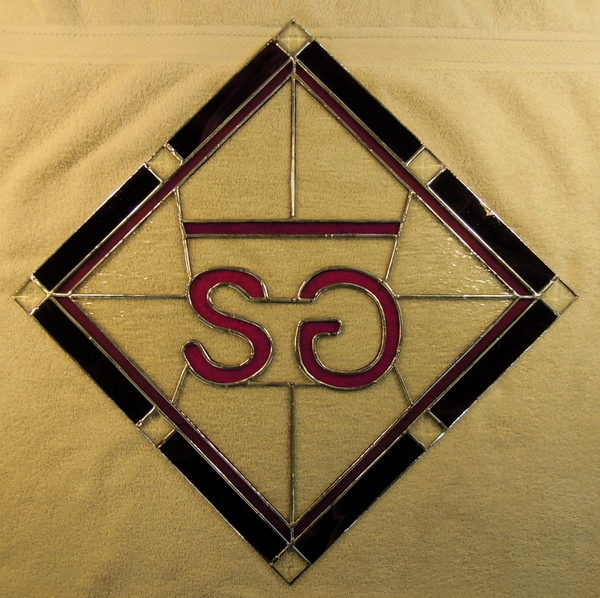 For her husband’s Christmas present this year a client wanted their cattle brand in a stained glass panel. The registered brand is Bar S Reverse G and shown. Around the edge we use 1×1 inch bevels. 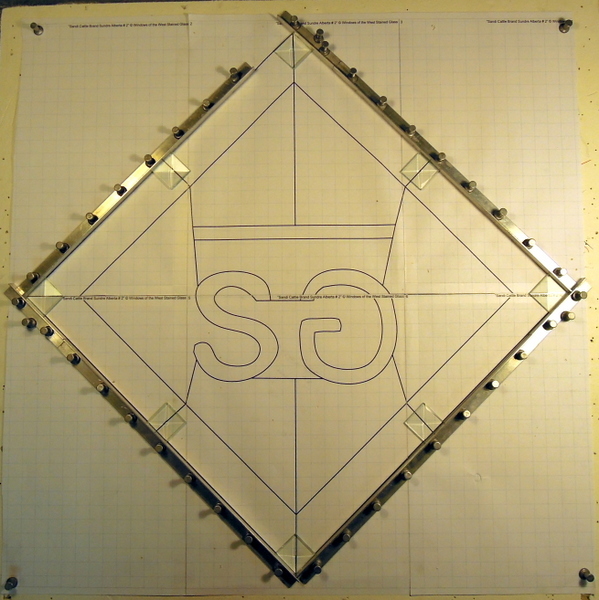 This picture shows the initial layout of the brand panel. 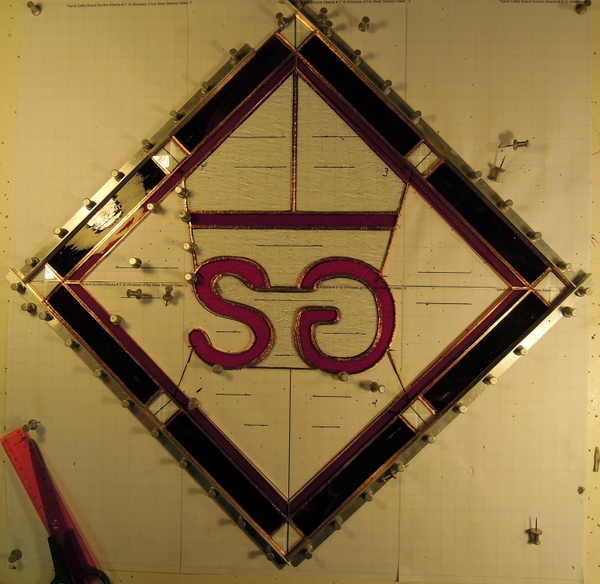 We use the Morton layout block system along measurements and a small square to ensure exacting size of the panel. 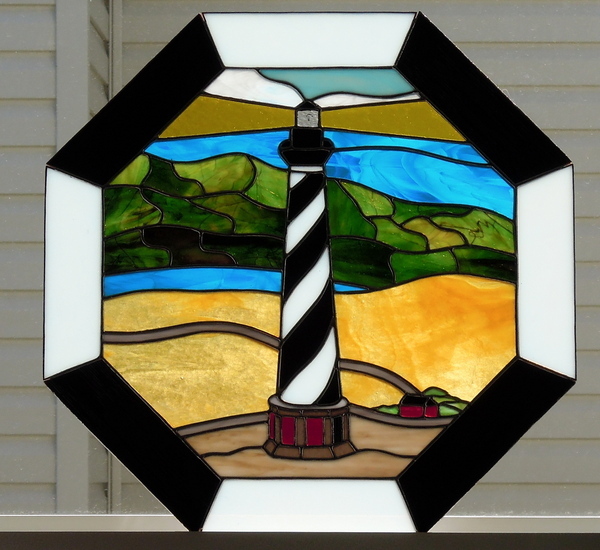 After Shaw TV Red Deer showed on network TV the YouTube video of our studio, we were most fortunate to obtain a wedding present commission for an octagonal light house which was eventually shipped to the town of S. Freeport on the USA seaboard coast in the State of Maine. Now that the wedding is over, here is the construction story. 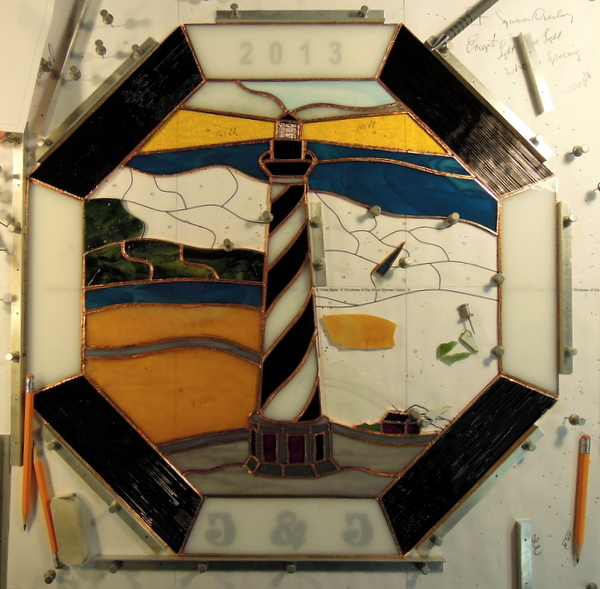 In addition we overlaid glass on this panel. 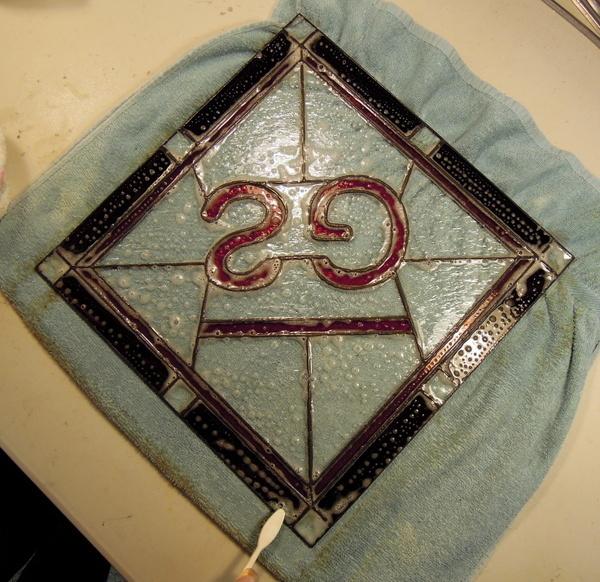 This 1st photo shows the beginning of construction of this panel which measures about 19 inches in size. For the outer edge of the panel, we used bone white Wissmach (51LL) and the black was a very neat Uroboros Fibroid Textured U-70-56-90. 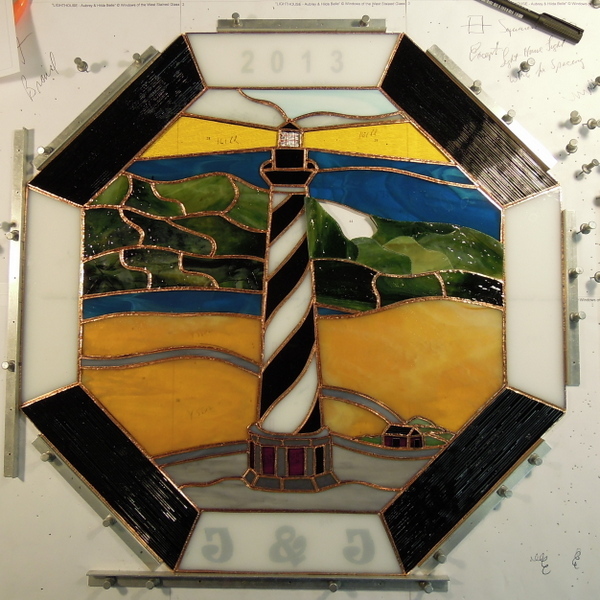 Construction continues in the next photo, with Spectrum Black Waterglass used in the lighthouse. In addition Spectrum Glass was used for the sky, yellow light rays, aqua water, roads, reds and some of the base. Wissmach 502D was also used for the land around the base of the light house. Uroboros U 65-145 for the green hills and Youghiogheny YO-5502SP for the sand dunes. 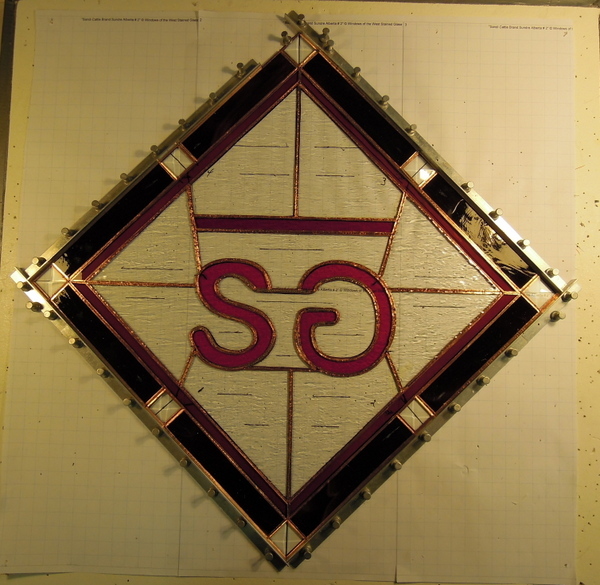 In this photo construction of the panel is nearing completion and close to being ready for soldering. The following picture the panel has been soldered and cleaned ready for black patina to be applied after taking steel wool (#0000) to the solder lines. Then a 1/2 inch zinc came edging was attached and joined to all of the panels solder joints, with more cleaning and patina applied. 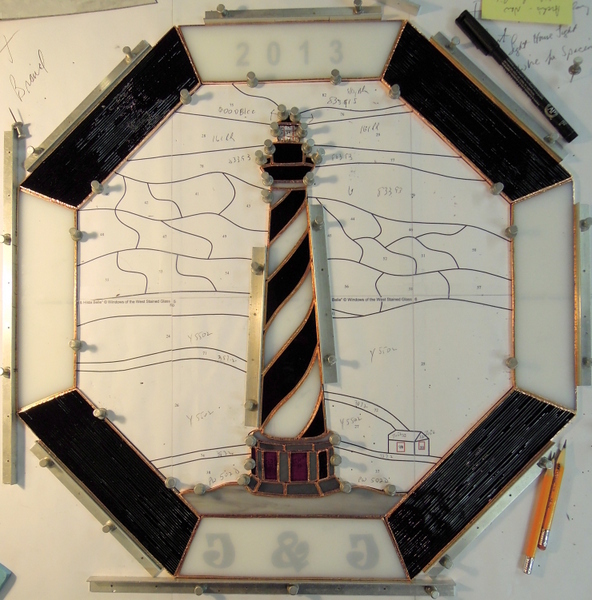 For the light house light we used very fine wire soldered into the adjoining seams. Then the panel was polished and cleaned and once that was done to our satisfaction we then applied the numbers, lettering and small windows on the light house and side building. These were are cut from Spectrum’s black cathedral glass and bonded to the panel using E 6000 glue. The 2, 1 & 3 were all one piece of glass and the 0 was 2. 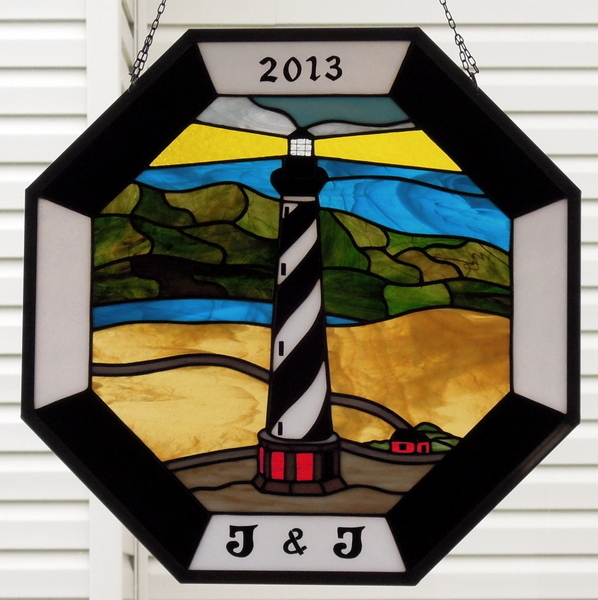 The J’s were one piece of glass and the ampersand was 4 pieces. Having a Taurus 3 Ring Saw allows us to do this fine work and complete it on a Glastar All Star Grinder using 1/8 inch grinding head. When we put jewels into a suncatcher, if you put a penny under them before soldering the piece, it raises the jewel above the surrounding glass and makes the jewels stand out and shows off their true beauty much more effectively. For pin boards we obtain smooth white ceiling tile which can be obtained in 2 ft x 4 ft sizes at most home building suppliers. We then cut boards to the size we desire, put 2 together back to back with the edges duck taped. That way you can use both sides many times. 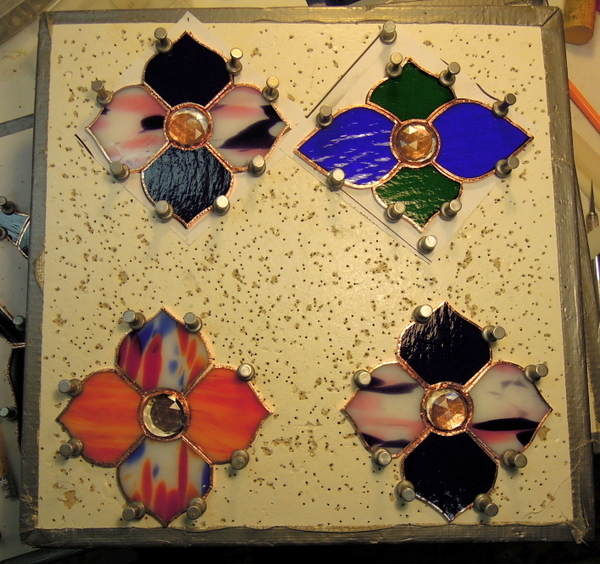 The stained glass pins hold your work extremely well on these boards. You can also make larger boards when needed and you can see that in the pictures of “Noah’s Ark” on our website that we made a couple of years ago. The reason we put 2 boards together is that they are much stronger and more rigid than just using a single piece of ceiling tile.